The need for creativity in religious education, whether because of difficult students or simply to avoid boring classroom experiences. The importance of real, personal connections to those we catechize (aka "discipleship" or "accompaniment"). Adult faith formation groups are popping up here and there and bearing much fruit. Eric Sammon's "The Heresy of Low Expectations" was very helpful and encouraged many of us to hold the bar high. We are all quite tired. We look forward to our spring meetings! There is room for one more parish/AFC in our Totus Tuus program this summer for the week of July 8-14. I'm delighted that we will have two teams serving the Diocese this summer and would love for all of the slots to be filled! Please contact Kevin for more information. Another reminder that if you have a local event that is open to other parishes, contact Penny Forst (pforst@dnu.org) to have it placed on the Local Events page on the diocesan website. 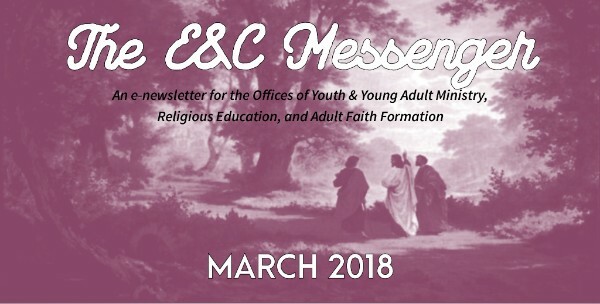 I will be checking this page before each E&C Messenger goes out and including them on the upcoming events section in each newsletter.